WvW, Why are we falling behind?! 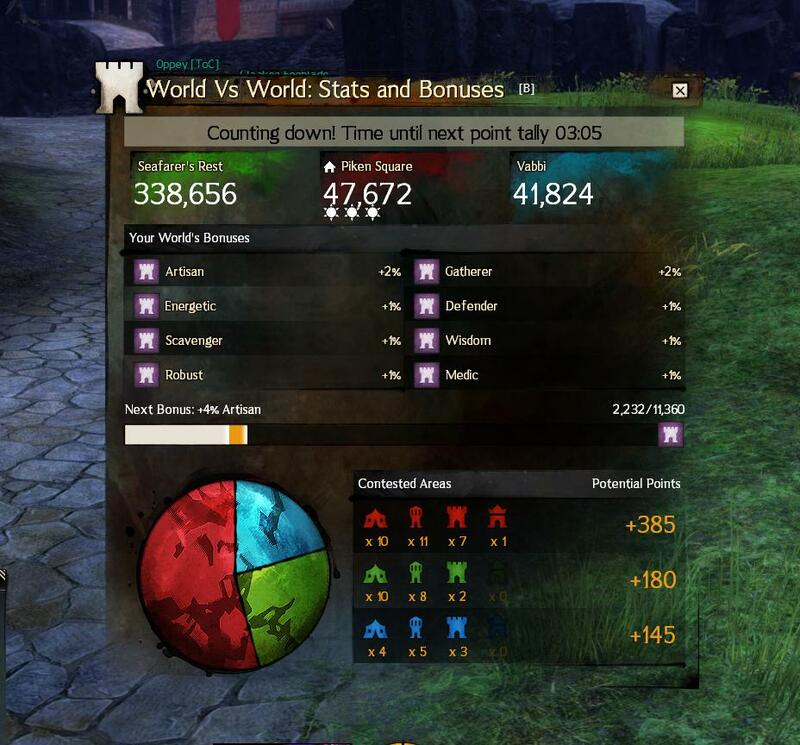 Forums » EU World-vs-World » WvW, Why are we falling behind?! I've noticed a lot of good PvPers instantly switching the server when they find out it's an RP server. Anyway, yesterday I made my first attempt at WvW after launch. It's probably obvious but my main feeling was that of being outnumbered. Wherever I moved out of our few keeps (I am talking about our home map...) the Seafearers were in large numbers. During these first weeks ArenaNet should switch more often our competitors and I am pretty confident that in a week or two we will be paired with servers more similar to us when it comes to numbers and WvW focus. As far as I am concerned there are 2 kinds of people I see on the WvW battlefields. Zombies... and Actual players. Zombies: They lack the intelligence to communicate with others and to understand what is being said to them. They never use chat to say what they are doing or ask for new directives, or even look at the chat box to get an update on what is going on. Like zombies, all they know is to wander around aimlessly, brainlessly attacking anything with red text above it, occasionally reuniting with the rest of the horde to charge at the nearest enemy keep's gate, regardless of how small the odds of capturing it are. Run forward --> Press C (or whatever they have 'Target closest enemy' set to) --> Mash buttons 1 to 0 --> Die and repeat. Actual players: Upon entering WvW, they first greet the server to assert themselves as capable of speech and for them to get an idea of how many other actual players there are for them to work with. Actual players are the ones that see the Chat box as the most valuable tool on the battlefield, and use it to good effect. Coordinating with other Actual players, they form Parties and small forces, to attack, capture or defend objectives they know to have more importance than simply just what happens to be closest. They know that a Supply-less Fort, is a lost Fort, and will either take measures to restock their own fort with, or deprive their enemies of it through the capture of Supply camps and the killing/escorting of Dolyaks. And? If they don't like RPers and what we do, then our server is better off without them. WvW isn't the only aspect of the game and if they are so intolerant that they would leave the server due to us then they would likely be the ones trying to disrupt people RPing and saying 'RP nerds LOLOLOL!!!1!!!1!11'. The real power in WvW lies with the guilds. They are far more efficient at organising large attacks and have the resources to maintain a war effort. The below thread is the EU RP community's attempt at creating a server-wide alliance of guilds and players with the goal of improving our standing in WvW. To those who are serious about having an impact in WvW, I recommend you check it out. Alas, the game hasn't even been out a week yet and the server populations are still in a state of flux, so of course we are going to get matched against vastly larger servers occasionally. As time progresses things will get more balanced, people will get better, and WvW will get more fun. Because Seafarer's Rest has the 4chan horde. I think we will be fine for now we are just building up our guild Critical failure. We dont know eachother all et, but as time goes I am sure we will become more active in WvW to. We run our own coordinated groups in WvW and are doing well with that. Would be happy to try some coordinating with others next. Contact me (legehk) ingame if you like to coordinate something with us as I have tended to run pvp side of things so far. I'd be happy to join in with you, although I can't pledge myself to your guild as I'm with TSV. Malomaeryn, Sylvari Guardian. I know that when I'm in WvW, I can hold my own but I usually play the role of support damage. You can find me chasing down squishies, or standing in the back and tossing elixirs with support fire covering the frontlines. "A hero's entry always comes late." Honestly, I would just say give it time. As mentioned above in other posts, the servers are still fluctuating, not only that but a vast majority of our own server population are still leveling/getting a feel for the game, and WvW may not be in their best interest at this time. GW2 isn't even a week old yet so try not to have too high expectations for the next--- ... at least couple weeks, me thinks. Let the servers even out, let the players saturate themselves in the game and we'll likely see what goes on from that point and maybe then this topic will be a lot more relevant. As for the Non-RPers leaving simply because this is a designated RP server? Pfft, let 'em go. We don't need the future grief anyhow. Yeah, I agree with Vitani. Tarnished Coast is a great server from what I have experienced through my time of exploration and whatnot, and I'm quite aware that on an "RP server" like ours, there aren't many people big into PVP. While there ARE people who do enjoy the PvPing, it's a bit saddening when people leave a server simply because our server isn't dominating in WvW. Our community is good and I honestly think that matters more. But in the cases where people would rather "be on top", there's not much we can do-- not that I care to do much about it anyway. All in all, I'm sure that with time, we'll be able to do something in WvW where we aren't looked down upon.